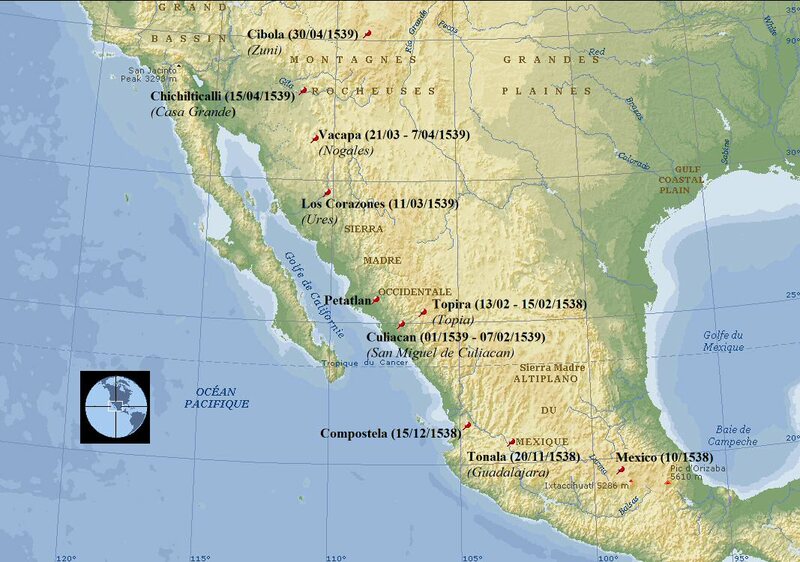 In 1539, Viceroy Mendoza of Mexico City enlisted Fray(Friar) Marcos de Niza to explore the western coast of Mexico to ensure that Mexico was not an island, and to investigate the possibility of the existence of wealthy cities to the north (Cibola). Esteban, whom was with Cabeza de Vaca on the 8-year journey from Florida, accompanied de Niza on this expedition. Fray de Niza had “rock star” status among the native people at the beginning of the trek in northern Sinaloa and Southern Sonora because he joyfully brought news that the brutal slave trader Guzman was banished by Viceroy Mendoza. Dozens, and perhaps hundreds of natives accompanied the de Niza group as bearers to show their admiration. The de Niza party spent little time investigating the coast after they saw it turn west on the northern end of the Gulf of California (Nallino thinks that he did not go to the coast at all), and travelled to the site of the current city of Nogales. The party then turned to follow the north-flowing Santa Cruz River (the river flowed then). It was here at Nogales that Esteban and de Niza parted, and Esteban began his race to be the first to discover Cibola, with de Niza following days and eventually even more than a week behind. The trails along the Santa Cruz river and San Pedro River that parallels the Santa Cruz that stretched to Cibola were major trade routes well known to the local natives and beyond. As one writer put it, “de Niza was not hacking it through the bush”. Marcos de Niza reported occupied farming villages along the Santa Cruz about every mile. The next site that de Niza reports is Chichilticale, at the Casa Grande ruins (see above Nallino map). Other authors in the past have also concluded that Chichilticale #1 was Casa Grande. Chichilticale means “red house” in Nahuatl (Aztec). The next spot de NIza reports on his journey is Cibola, only 15 days later; this is 275 miles away as the crow flies. This amounts to a serious traveling speed, about 20 miles per day. This is believable considering the other dates, but herein is the problem….. Marcos de Niza, a man of God, never saw Cibola………… even though he said he did. Marcos reports that he saw Cibola from a distance and it was as big as Mexico City. Considering Mexico city may have been the largest city in the world a the time, this was quite a statement. Marcos said they turned back when he met the fleeing Indians that had accompanied Esteban; they described how Esteban was killed by the Zunis. In the the next year, 1540, de Niza is assigned the task of guiding the Coronado expedition, which consisted of about 1300 people. They travelled up the San Pedro river (it flowed then also), and they made a hard right near present day Tombstone. They then traveled to a Chichilticale #2 (we’ll get to that) at the Kuykendall ruins at the western foot of the Chiricahua Mountains and then over present-day Apache Pass. It is amazing how the stage was set in 1540 for what was to come 300 years later with the Apaches! 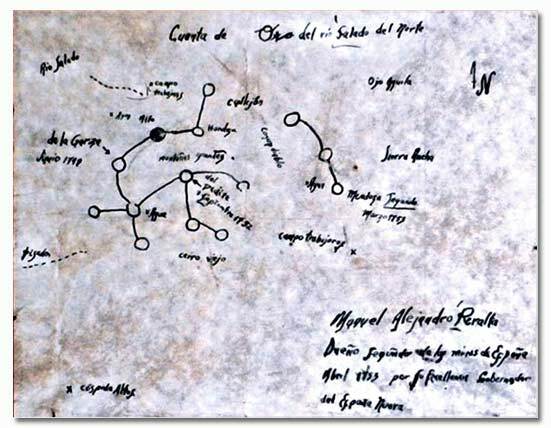 (See map below for routes of the de Niza and Coronado expeditions and the map of the location of Chichilticale #2). Coronado expressed his disappointment when seeing the Kuykendall ruins, thinking they were Chichilticale (Note: Niza had guided him there). They were very small ruins. As Nallino wrote (paraphrasing); Chichilticale must have been a well-known place, before either the de Niza or Coronado expeditions. And, how did it get an Aztec name?, and why was Coronado disappointed? It is important to mention that this was the only place described during the de Niza or Coronado expeditions that had an Aztec name. It was proven by an archeological dig that the Coronado expedition did indeed camp at the Kuykendall ruins, and artifacts representing what a large party would have left behind were found. Two of the most important items found were an iron crossbow bolt-arrowhead and a coin of that time period. Nallino makes a good argument that there were two Chichilticale: the one that de Niza puts in his report of his original expedition with the location described almost as a riddle (Casa Grande), and the second one at the Kuykendall ruins south of Wilcox (Note: de Niza passed by Kuykendall on his trip back to Mexico with Esteban’s party). 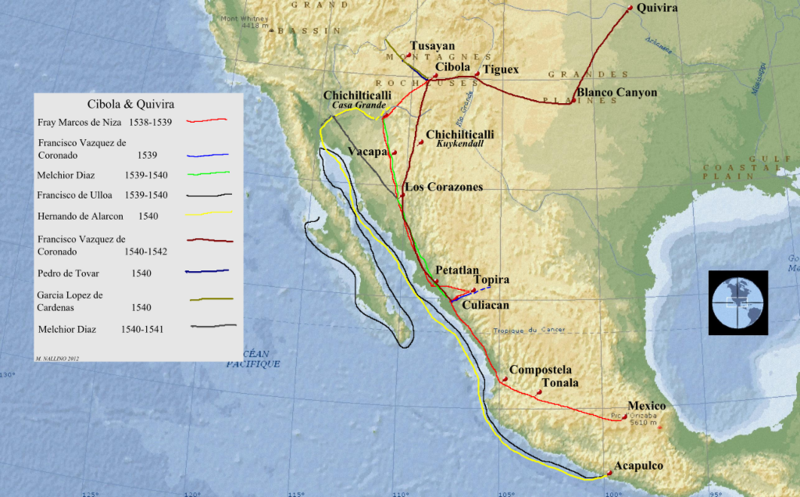 In summary, the de Niza expedition travelled north to Cibola on the Santa Cruz River, and travelled back south along the north flowing but more eastern San Pedro on his return trip (so he knew where to take Coronado the next year). When the Coronado expedition reached Cibola and its insignificance was learned, de Niza became a most-hated individual and possibly the only thing that saved his life was that he was a Catholic Friar. Marcos was then replaced by Friar Pedro de Castaneda and Castaneda wrote that by the time Esteban reached Cibola, de Niza had not even left Chichilicale #1. And, Castaneda wrote that de Niza was 60 leagues (180 miles) from Cibola when he met the fleeing natives that accompanied Esteban, and that was the closest that de Niza got to Cibola. Friar de Niza was a respected and honored man up until Cibola was reached by the Coronado expedition. The Coronado expedition was privately funded, and some members never recovered from the debt they assumed to go on the expedition. Niza spent the rest of his life in supposed shame. The larger question is: Why did Friar Marcos de Niza lie? He had a good reason to turn back before he reached Cibola, and no one would have blamed him for returning after hearing of Estaban’s death. So why did he concoct the tale that the Zuni pueblo was as large as Mexico City? Marcos de Niza intentionally deceived Coronado about the immensity of Cibola. The only logical reason that can be thought of why he would tell such a “whopper” was to re-direct attention away from the Aztec gold deposits. When de Niza guided the Coronado expedition to Chichilticale #2, only one day was spent at the other campsites, but 3 days were spent at Chichilticale (see dates on map above). 1300 privately-funded people are not going to stop for one or a few persons having illness or injury. There had to be a special reason to stop for that long that most or all of the party would have agreed to: Chichilticale. Friar Marcos de Niza’s plan worked. Hernando de Alarcon was in command of 3 ships that sailed up the Sea of Cortez and up the Colorado River as far as 100 miles to meet the Coronado expedition with supplies. It would seem that both the Coronado and Alarcon parties were intentionally misguided. 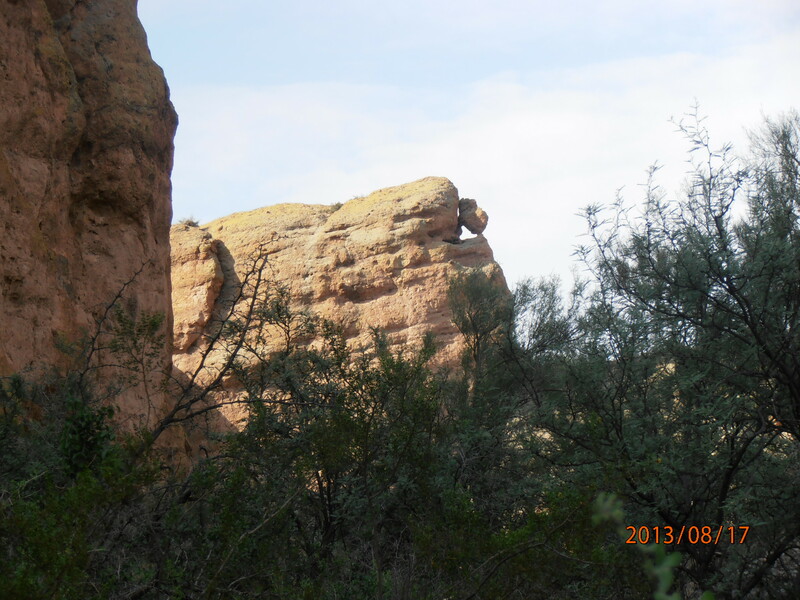 Goldfield is the only bonanza-grade gold district nearby Casa Grande. Gold from the supergene enrichment of gold-bearing high-sulphidation VMS ore deposits commonly has a purity of over 90%. The rare coincidence of brine lakes that covered the Goldfield District during and after the sulfide ore was deposited was ideal for the creation of supergene gold. This type of gold was found in the modern-day Goldfield in large amounts. Below is a map of the mineral potential of the Superstitions and surrounding area that was completed by the US Bureau of Mines and the US Geological Survey in 1993 using available geophysical data. The red areas have high mineral deposit potential. Please note that the northwest end of the mountains has nearly the same potential as the Superior/Resolution area shown at the SE corner of the map. Many miles of drilling has been completed to delineate the magnificent Resolution deposit since this map was made, but little has been done on the Goldfield end, and especially at the Molly Marie Prospect. An entire mining district CAN exist right out in the open in 2018 that has not been touched since 1851. It is suggested that the the pits near Goldfield where gold was mined before 1520 were simply filled-in. Modern-day explorationists have not given these pit locations the time of day because the gold bearing outcrops have been removed. But, the alteration zones, and especially a black chlorite zone that surrounded each of the outcrops remains. Several pit locations have been found seismically at the Molly Marie Prospect, and many more may be able to be located at nearby Goldfield. Marco de Niza had seen the horrors of the Spanish occupation and the hundreds of thousands of Indians that died in slavery. He knew that the discovery of the gold deposits would result in more slavery and extermination of the peaceful native people he met along the Santa Cruz (Pima), just like what had happened to the entire population of the Caribbean. 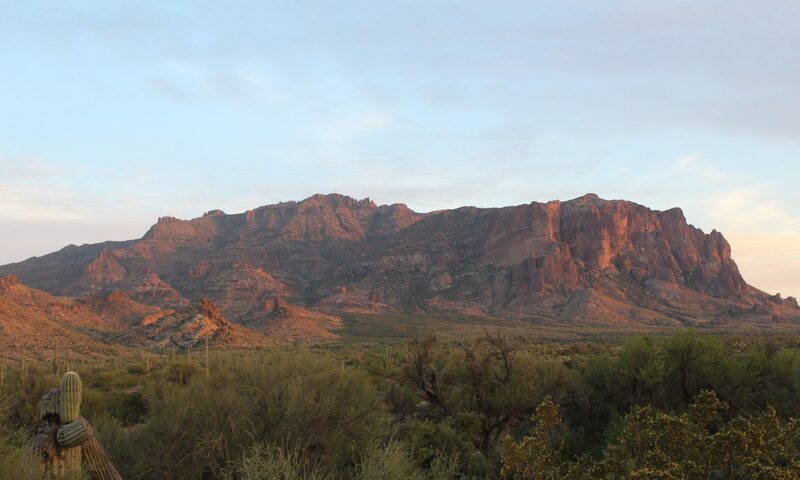 It is theorized that de Niza lied about the location of Chichilticale to save the Pima and others and tried to keep the Coronado expedition as far away from Superstition mountain as possible (because of its odd and possibly renowned rugged shape). It can only be speculated what tales and clues circulated at that time, and “Chichilticale” near rugged mountains seems to have been one of them. Superstition Mountain (with the Goldfield District is at its foot) can be seen from the Casa Grande ruins. Marcos de Niza had a week or more that was unaccounted for (the 60 leagues). It is theorized de Niza went on an extended exploration and mapping trip near the Goldfield District and directed others to further hide the mines and trails. Marcos was a Franciscan, not a Jesuit. If he had been a Jesuit, there may have been an entirely different outcome. De Niza may even have told his Franciscan superiors what was found, and the consensus may have been to divert Coronado’s attention away from the area. The Franciscan’s were well known for helping natives escape Spanish brutality. In 1691, Father Kino, a Jesuit, recorded his first trip into Arizona. He reports visiting the Casa Grande ruins in 1694. It is theorized that because he had befriended and helped the Pima, they told him of the place where the Pima-hated Apaches had mined the gold 150 years before. Below is a 1701 Kino map. The area held by the Apache is shown north of the Gila River. Superstition Mountain and its shape is indicated on the map north of Casa Grande. Kino, being a Jesuit businessman, took a different tack. Rather than say anything to the Spanish government, he cut a deal with the Peralta’s. They would mine the deposits, play it down, and the Jesuits would take their cut. 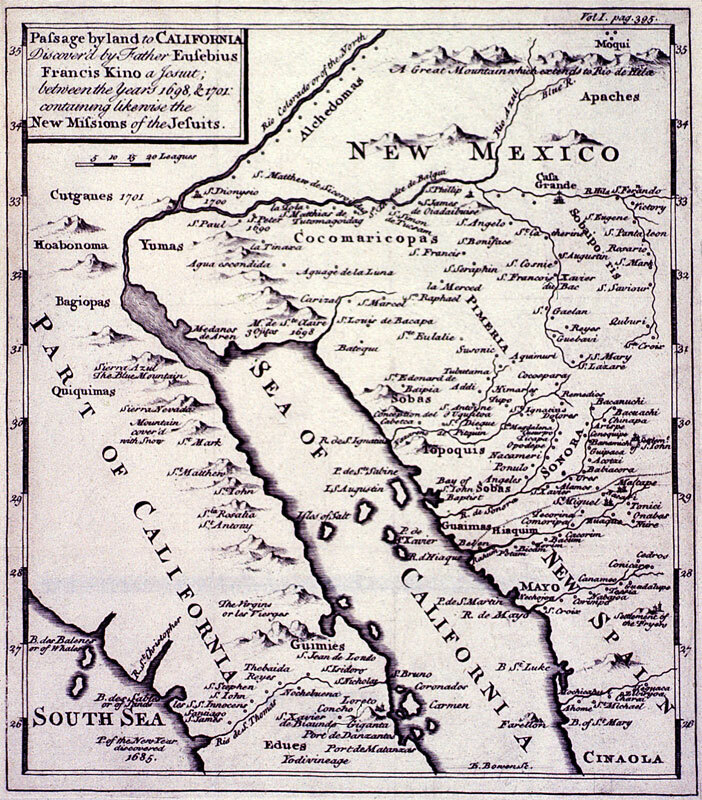 It is suggested (another story) that the gold went straight down the Salt or Gila Rivers down to the Gulf of California (both shown on the map). History dictates that half or more of all the gold and silver mined in Mexico up to about 1830 went to China via the black market. This was achieved by massive under-reporting of the cargoes of the “Manila galleons” that sailed between Acapulco and Manila, or the metal was shipped by privateers directly to Macau. It is theorized that the Goldfield District was mined well before the Spanish invasion of Mexico. At the Casa Grande museum, a “rock crusher” is on display. The Hohokam didn’t mine (or did they? ), but the theory is presented that the below item was taken from the nearby mines. The line across the item is a shadow. Seen up close, this item is believed to be technology that was not known to the Hohokam. 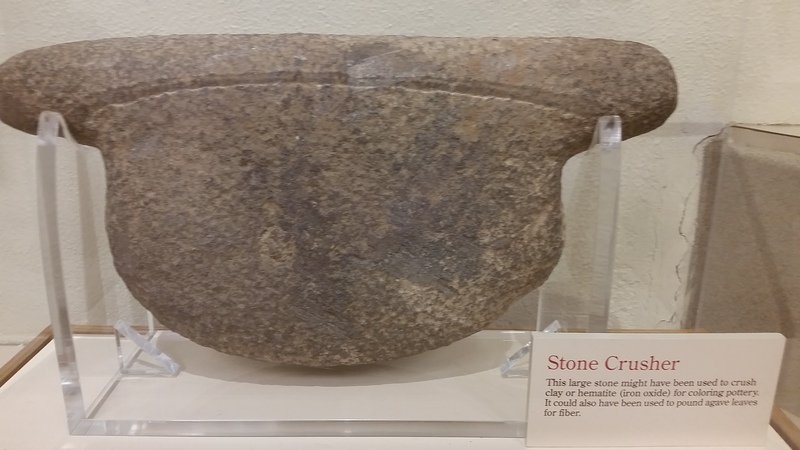 It weighs an estimated 30 pounds, and would be for crushing ore, not pottery. Dovetailing with the Chichilticale story is the “Burbridge” map with Manuel Alejandro Peralta’s name on it, dated 1753. For the sake of clarity, a drawn copy with translations is shown below. The original was found hidden in the cover of an old book in Mexico in 1966. It was verified by the University of Arizona that the map is from the 18th century. Using the same map style of the Peralta-Fish and the Peralta Stone Maps, the map brings the outlier features in close to the central focus area of the map. The map is below, and the most important link to the Chichilticale story that is presented in the map is the “footprint trail” that is labeled. Why would it state specifically that the trail was made by feet? Maybe because the natives that had made it had no horses, or wheels? The Mesoamerican trail system extended up the Santa Cruz to Chichilticale #1 (Case Grande), and along the San Pedro river to Chichilticale #2, along the Gila, and extended to Cibola. The idea is presented here that the trail system extended from Chichilticale #1 to what is now known as the Goldfield mining district (and the Molly Marie Prospect) and that portions of the trail were still visible in 1753. It is theorized that Friar Niza’a party hid or destroyed a part of this highly-traveled trail. Note: the original Burbridge map below shows footprint trails extending both from the Salt River and around the west end of Superstition Mountain. It is believed that the Burbridge map is clearly the details of an exploration project located on the Molly Marie Prospect. 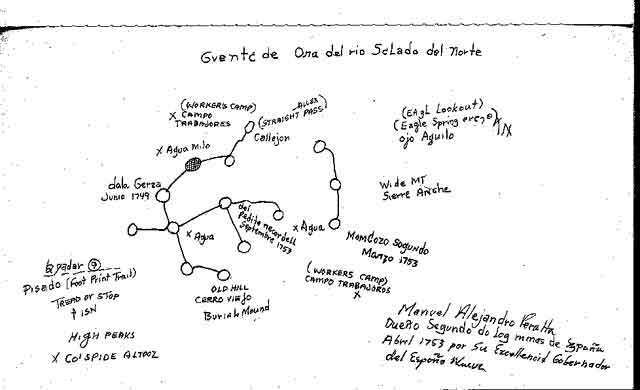 Across the top of the map is the title “Gvente de Ona del Rio Salado Del Norte”. The first word is “Gvente”, an older form of a Spanish/Portuguese word that is still used in Brazil and means “esteemed people”. The third word is “Ona”, and is Latin for “district”. The rest is Spanish. The full translation would be “Esteemed People of the Salt River District of the North.” The real Burbridge map locates the district between Superstition Mountain and the Salt River. An xrf (x-ray fluorescence) test (handheld unit) could easily prove or disprove if the Aztec-Goldfield theory is true. Even though there are only a couple of handfuls of Aztec gold that remain in the world in its original state, it does exist. An xrf of Aztec gold has possibly been done already. There is little doubt that Marcos de Niza knew exactly where he was going on his first journey before he left Mexico City. As soon as he was shed of Esteban, he got down to business. He found the ancient trail crossing the Gila river with the mines maybe partially filled in, and his people concealed more with the time they had. After he met Esteban’s party fleeing south on the most direct route to Mexico City, de Niza also turned south with them to meet the San Pedro River. 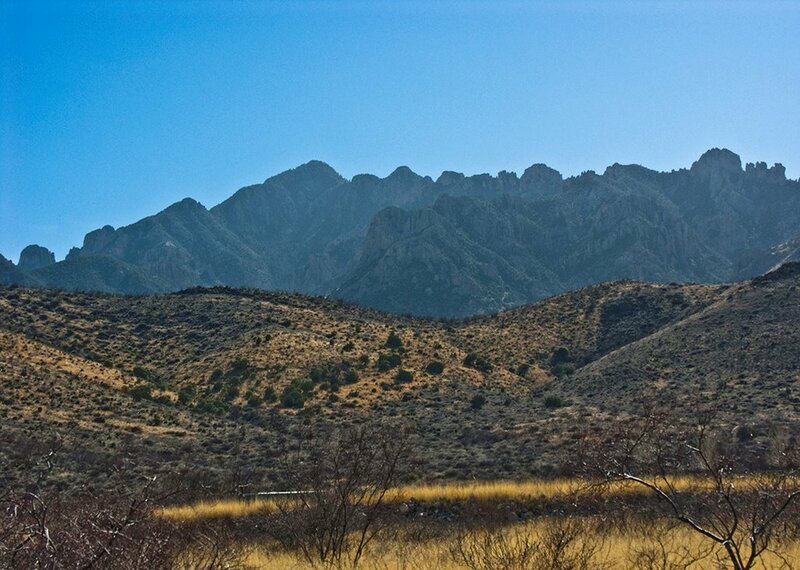 He was able to find or was told of Chichilticale #2 which is near the Chiricahua Mountains (see below photo). Although not the Superstition Mountains, they are very rugged, as the tale would have been told, and can be seen from Chichilticale #2. Friar Marcos de Niza’s plan to conceal was complete.